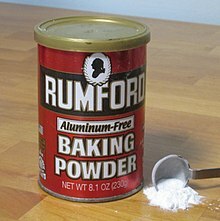 Baking powder is a leavening agent composed of baking soda and one or more acidic salts, such as tartaric acid (cream of tartar) or dicalcium phosphate dihydrate. As the baking powder dissolves, the baking soda reacts with the acids to produce carbon dioxide gas bubbles, which are trapped by the dough around them. Baking powder is used in recipes where the pH is 7, or neutral, and pure baking soda would fail to produce bubbles. Most baking powders are double-action, which means they have two or more acids in them, one to react and create the carbon dioxide at room temperature, and one that will not react to create the bubbles until the temperature is elevated, in the oven. Baking powder is most often found in quick breads like pancakes, waffles, and muffins.